These old buildings are located on the north side of SH 88 in Pine Ridge, Arkansas. Old SH 88 is just left of the store and the new SH 88 is further left out of view. We decided to take a break from the river photographing project and enjoyed our visit in the store and museum. The elevation at Pine Ridge is about 800 feet. 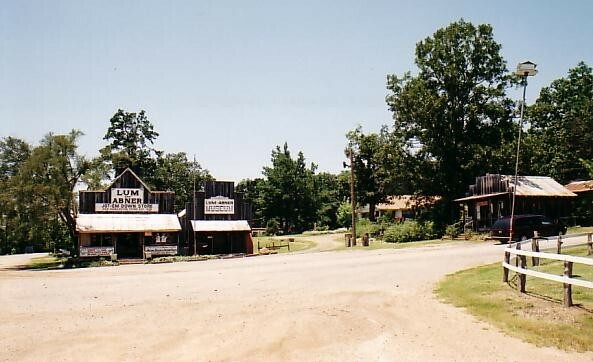 Pine Ridge, Arkansas, is the location of the store made famous on the old 1930's Lum ‘n Abner radio show as the ‘Jot ‘em Down’ store. The store is unmoved since its construction there in 1909. The post office was originally named ‘Waters’ for the original postmaster. The creators of "Lum ‘n Abner" (a couple of young guys from Mena, whose parents knew the owner of this store) thought Pine Ridge was a better name for the town in their radio program and eventually joined a successful drive to have the name of the real town changed to Pine Ridge. The building next door was originally across the road. It was moved to this location and is now a Lum ‘n Abner museum: admittance - 50 cents. From this point on to Lake Ouachita, the river is good for canoeing. There are several canoe rental locations and several areas with access to the river. The Jot 'em Down Store in Pine Ridge - Web site of the folks who run the 'Jot 'em Down' Store in Pine Ridge, AR. Check out the pictures and information on their nice web site. They tell a little about the history of the town and about the two young country boys who turned a comedy routine into a 25-year career in radio and movies. Lum 'n' Abner Study - Arkansas Memory Project by David Crouch on the effect of the Lum 'n' Abner show on other comedy radio shows of the time or vice versa. This is an interesting web site research project. Postcard Views - A postcard view of Pine Ridge in the 30's before the building, that is now the museum, was moved to its present location. Many other old postcard scenes are shown and a history of Pine Ridge (formerly Waters) is given. Hot Springs National Park - Also check out this great web site for the Hot Springs National Park. It has a selection of current photographs and some interesting old photographs of the area. There are some old stories and current information about the park and city.